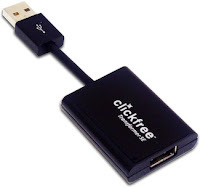 Clickfree Automatic Backup Transformer SE = Awesome! I was at Fred Meyer on the weekend and bought the Clickfree Automatic Backup Transformer SE. It's a small USB device that allows you to convert any external hard drive (or any iPod/iPhone) into a Clickfree drive. I bought it not so much for the backup function, but mostly for the "Bonus Feature" listed on the back of the package that says "Automatically copy the music from any iPod to your computer." I thought that this would be very handy in case the music on my desktop was ever lost. I'm so happy with the way that this worked that I had to write a review. When you connect your iPod to the Clickfree Transformer, the program starts automatically. There's a 30-second countdown timer that shows to allow you to choose options before it starts to back-up your data. One of the options on the screen is to copy music from your iPod. When you choose that option, you are given a choice of copying All Music or selecting only the playlists that you want. You can also select the directory on your computer where you want it to be copied to. The most impressive thing is that it copies the songs and playlists and adds it to your iTunes Library automatically. There is no extra work that you need to do. I know they advertised it as being easy, but I didn't believe that it would be that easy! The fact that I was able to buy the Clickfree Transformer SE for only $10 makes it extra sweet. I saw it for sale at that price earlier in the summer and I think that Fred Meyer is trying to get rid of old stock. There were only a couple of them left on the shelf on the weekend, but I'm surprised that they weren't all snapped up sooner.